The Double Cluster is comprised of a pair of open or galactic star clusters, a lovely starfield in the northern constellation of Perseus. They are an easy binocular target, and once you know their position they are also readily visible to the unaided eye from dark sky areas. It was first cataloged in 130 BC by Greek astronomer Hipparchus. Click the picture to see it a bit larger, then hit Back when done. Some 7,000 light-years away, and now known as h and chi Persei, or NGC 869 and NGC 884 (not shown), the clusters are separated by only a few hundred light-years and contain stars much younger and hotter than our Sun. 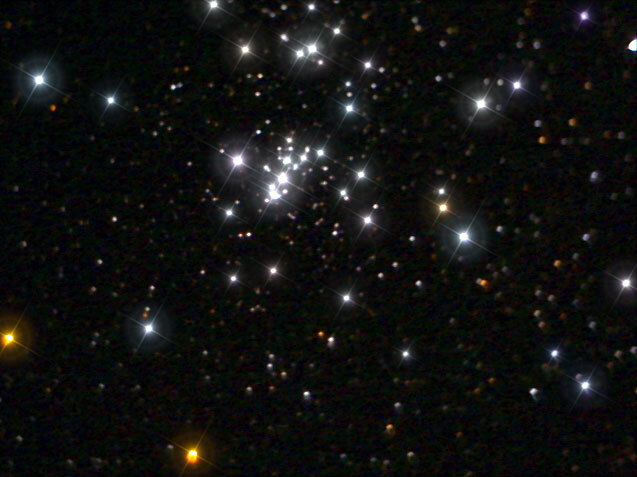 In addition to being physically close together, the clusters’ ages are similar and both clusters were likely a product of the same star-forming region. Copyright © 2008 Jims Orion XT10 Astronomy Blog. All rights reserved.